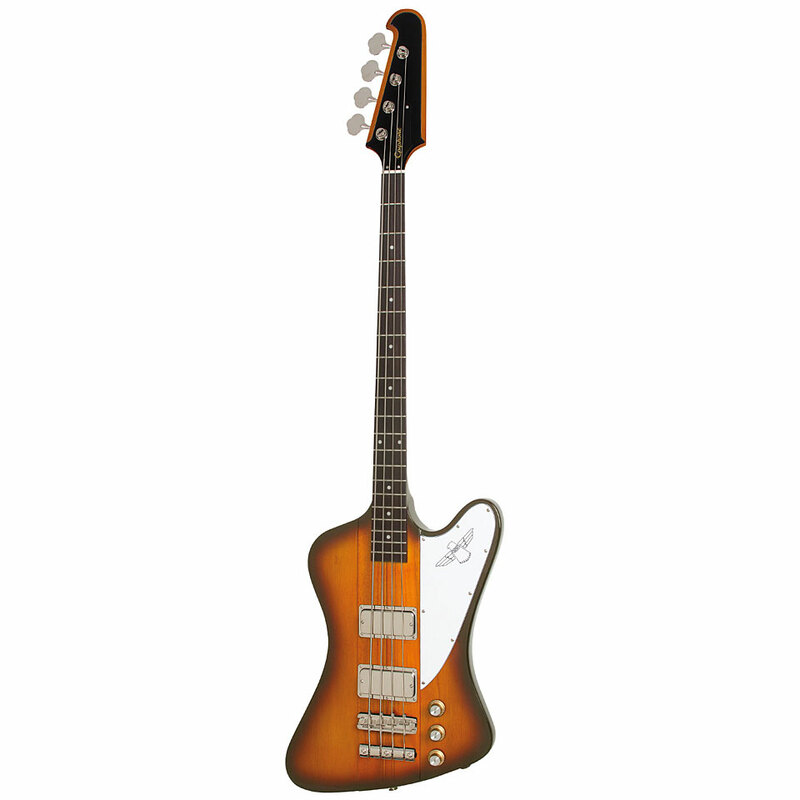 The classic Thunderbird bass guitar plus active electronics with the Epiphone Thunderbird Pro IV 4-string bass, distinctive design and amazing sustain! The Epiphone Thunderbird Pro IV bass provides great tone, striking looks and unbeatable playability from a distinctive alder body and fast, 34-inch scale length 7-piece neck. Two humbucking pickups with active electronics put out plenty of volume, with tone that ranges from thick to punchy. The Epiphone Thunderbird Pro IV bass's feature a rock-solid, 7-piece (Walnut/Maple/Walnut/Maple/Walnut/Maple/Walnut) neck with through-body construction for amazing sustain and tone. Though it features a substantial body shape, the Epiphone Thunderbird Pro IV bass is lightweight and very comfortable for holding down the bottom end onstage. The pickup configuration on the 4-string Epiphone Thunderbird Pro IV electric bass is unique. Rather than placing a pickup near the neck, which could muddy the tone, the Epiphone Thunderbird Pro IV bass mounts middle and bridge pickups. This lets you dial in everything from growling tones to funky punch. 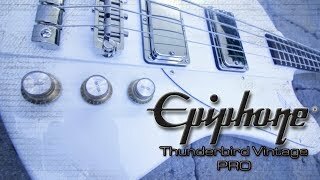 The pickups are Epiphone T-Pro bass humbucking pickups paired with custom active electronics and EQ, making the Epiphone Thunderbird Pro IV a very versatile bass capable of a wide variety of tonal options. Other features include premium die-cast 14:1 bass machine heads, a flush-mount fully-adjustable bridge, black hardware, and Slim-Taper neck profile with an Epiphone designed straight-string pull headstock. Epiphone's SlimTaper neck design maintains a precise width-to-thickness ratio on the neck. This design provides added comfort and agility when racing through the frets, while not fatiguing your fingers. 7-piece Walnut / Maple Neck. This is what happens when you leave an automobile designers to create a bass! The Thunderbird has the charm of a road cruiser from the tail fin era. Gibson's subsidiary Epiphone has also made these cool classics and offers this quaint monster with many features and variations. THIS BASS IS AMAZING. PERFECT SOUND AND FEEL. I ALSO HAVE A GIBSON THUNDERBIR BUT I LIKE THIS ONE BETTER. This item was given an average rating of 4.3 out of 5 stars. 1 review has been written. The comments are not the opinion of Musik Produktiv, they are the subjective opinions of our customers. 7 ratings exist without a text or these reviews are written in another language.